Mitchell Squire is acclaimed for his interdisciplinary work that engages material culture, architecture, and visual art to examine current and historical social and political issues. This assemblage, part of a body of work Squire began in 2013, considers the contemporary issue of police shootings of African American citizens and their aftermath. 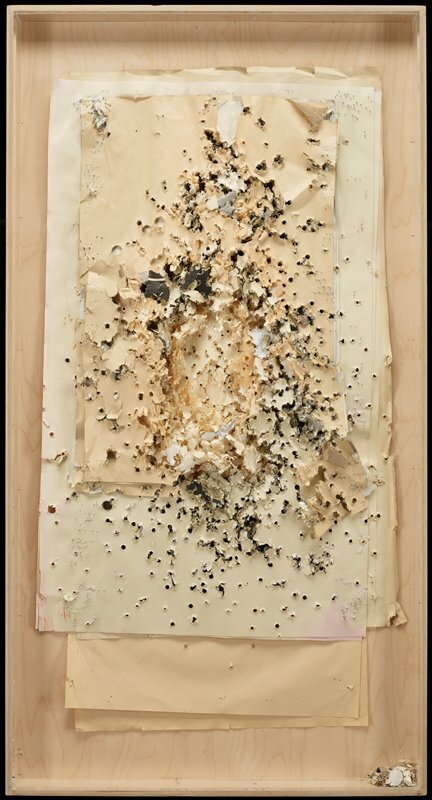 The works feature accumulations of law enforcement paper firearms targets riddled with bullet holes that were salvaged from an Iowa police academy. Squire presents them as thick layers of torn and perforated targets with the reverse side facing outward, so that the viewer stands in the shooter’s “line of fire.” The shooting patterns that developed on the mass of targets resemble highly abstracted human figures. The effect is twofold. First, there is a compelling aesthetic component in these assemblages, a visually appealing abstraction of torn and degraded paper in which color, form, texture, and materiality exist independently of meaning. Second, when the nature and source of the paper targets is known, a flood of associations and meanings takes hold. This duality, or even contradiction, is acknowledged by the artist, who suggests that the two effects can coincide. By intention, Squire’s assemblages transcend their materiality, offering viewers a poignant and sobering portrait of the complex relationships between gun violence, racial discrimination, and the mediation of personal and national tragedies.